We have extensive experience within the Healthcare & Hospital Sector and currently carry out services and repairs for the Northwest London Hospital Group where we service the main hospital Water Softening Plant on an annual service contract breakdown basis, within this contract we have also carried out a refurbishment of this Plant which included rebuilding of pipe work, installing new controllers, water meters and a resin recharge. We have experience of Fleck, Siata, Autotrole and Clack values and with regards to Reverse Osmosis plants we have experience of Herco, Eurowater and Watts. We also Clean and Chlorinate Cold Water Tanks including Hot & Cold Water Services using water treatment chemicals manufactured in the UK. Within our introduction are some case studies which I hope will be of interest to you. Some of the equipment we have supplied and serviced includes Boiler Feed, Plant Room Wash Down and Final Rinse Water on production lines and processes. We also offer services is in Legionella and Water Hygiene where we provide advice, servicing and monitoring on all matters relating to the control, management and prevention of Legionella and its associated risks in accordance with ACoP L8. We have experience with Cooling Towers, Evaporating Condensers, Closed Chilled Water Systems and Hot & Cold Water Systems from commission to operation, servicing and monitoring, risk assessments and advice on equipment or refurbishment. 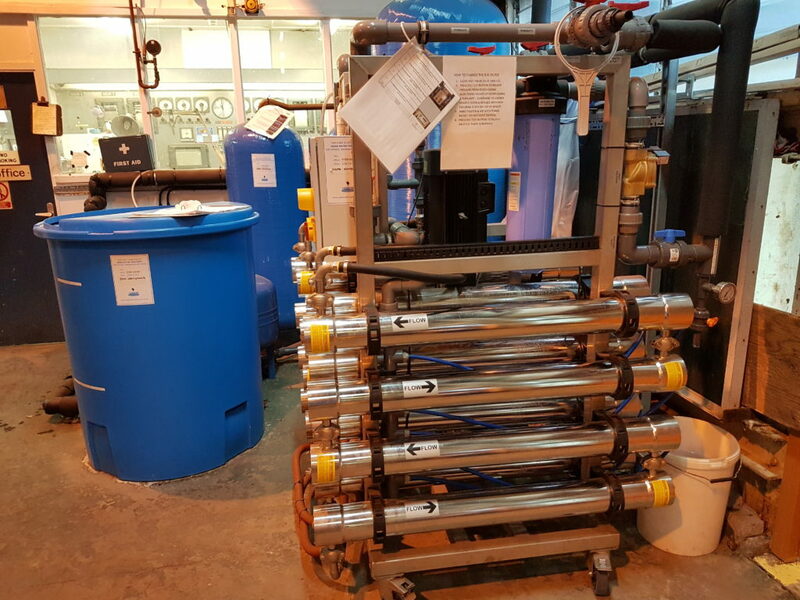 image shows Reverse Osmosis Water Treatment Package supplied installed commissioned and now serviced by Cedek water Treatment which replaces an old Dealkaliser unit.